Nachos are a popular family favorite for snacks, but with a few healthy twists they can even be a satisfying and delicious meal. As a family caregiver, you know how important it is to encourage your elderly loved one to eat a healthy and balanced diet, but that doesn’t mean that they should have to sacrifice the tastes they love. 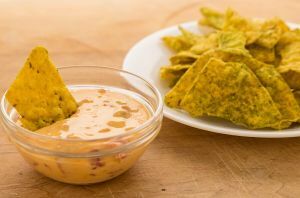 Encouraging healthy twists on favorites such as nachos let them enjoy the kinds of meals, snacks, and treats they most enjoy, while still giving their body what they need to thrive. * Choose beans rather than meat to reduce fat and calories, and increase fiber and minerals. * Load on the vegetables. Try roasting corn and onions, making homemade guacamole, or adding fajita-style peppers. * Rather than using chips, try slices of zucchini and yellow squash. * Try a breakfast version to get the day started on a healthy note. Use tortilla chips baked until crisp, and top with scrambled eggs, onions and green peppers, turkey sausage crumbles, and a sprinkle of cheese. * Make a flavor profile twist by creating Greek nachos. Bake wedges of pita until they are crisp and top with Greek sausage crumbles, lettuce, tomatoes, olives, feta cheese, and a drizzle of tzatziki. * Get creative with dessert and encourage talking, sharing, and bonding over the sweet dish by sprinkling wedges of tortillas with cinnamon and sugar before baking, and topping with apple or pumpkin pie filling, roasted nuts, and a dollop of whipped cream. Serve family style to make dessert interactive and fun. Healthy eating is important for everyone, and as a family caregiver you are likely concerned about how your elderly loved one eats on a regular basis. It may feel overwhelming to try to come up with healthy meals and snacks to make quickly and easily so your senior can get the nutrients they need on a regular basis. Fortunately, you don’t have to do this alone. Elderly care can be an exceptional way to make it easier for you to pursue this goal. An elderly home care services provider can be with your aging parent on a customized schedule to help them maintain their independence while also pursuing a healthy, balanced diet. This can include safe and reliable transportation to the grocery store to stock their home with healthy foods, meal preparation, snack preparation, encouragement to stay hydrated, and more. For Elderly Care Services in Covington TN, please contact the caring staff at Personal Care Services MidSouth today! This entry was posted in Elderly Care Covington TN, Healthy Eating for Seniors and tagged Elderly Care Covington TN. Bookmark the permalink.